Senior students in our Mechanical Engineering Department solve real-life engineering problems for industry sponsors in this two-semester course. Students learn about the principles of design, how ethics affect engineering decisions, how professionals communicate ideas, and the day-to-day implications of intellectual property. The program gives students the chance to apply the technical skills they have gained, and to expand their abilities in analysis-based innovation and engineering judgment. Students begin by researching the problem, brainstorming a range of solutions, and traveling to the sponsor company site to learn more about the company and the project. As their projects take form, student teams keep in touch with their industrial and faculty mentors, hold meetings, write formal documentation, and make presentations on their work. By the end of the year the teams produce a working or virtual demonstration of their solution. Corporate sponsors have a chance to meet and work with students for focused hiring, and industry representatives can get to know UConn graduate students and faculty for future consulting and research activities. Sponsors provide a technical representative to periodically meet with the team, monitor and mentor their progress, and infuse real-world input and guidance. 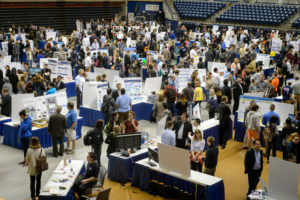 Senior Design Demonstration Day gives parents, friends, and sponsors the chance to see projects at work, ask questions of students, and learn more about mechanical engineering at the University of Connecticut. Students explain their projects to visitors and to a team of judges chosen from local engineering industries. The judges review the projects and award first- through third-place cash prizes for excellence. An additional prize is awarded to a team chosen by faculty voters. UConn Mechanical Engineering students demonstrate they are prepared to lead, create, and innovate through their senior projects. Many seniors have been offered jobs from their company sponsor before graduation. Please contact us to sponsor a project or to learn more.